A soft vanilla cake layered with raspberry jam and champagne frosting. 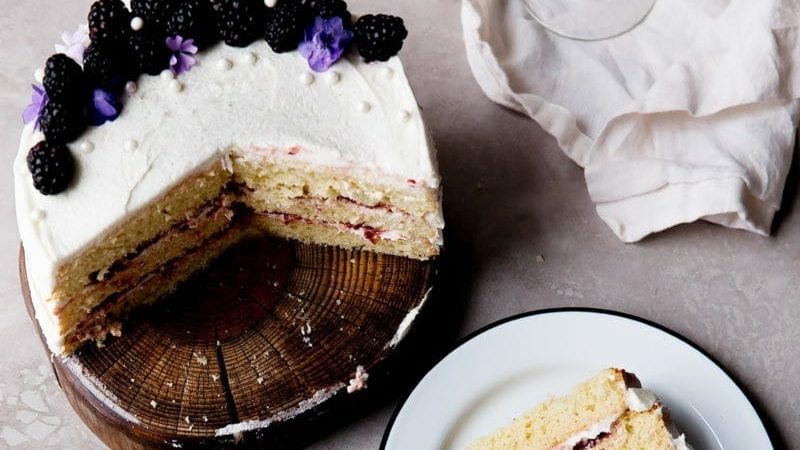 Use Rodelle Vanilla Extract in the cake and frosting for a celebration cake you won’t forget! Preheat oven to 350F. Grease three 8-1/2" cake pans and set aside. In a large bowl, whip eggs and both sugars for 2 minutes. Add in oil and Rodelle vanilla extract. In a separate bowl, sift together baking powder, flour and salt. Fold half of flour mixture into wet ingredients, then pour in half of your milk. Repeat with remaining flour and remaining milk. Pour batter equally into three prepared pans. Bake for 20 minutes, rotating halfway through. Once cooked, allow to cool completely before frosting. Simmer 1 1/2 cups of champagne in a small saucepan over low heat for about 25 minutes, swirling the pan every few minutes to prevent burning. You want to end up with a little over 3 tablespoons of champagne. It will reduce with patience. Once reduced, allow to cool completely. To make the frosting, whip butter, cream cheese and vanilla extract until light and fluffy, about 2 minutes. Add in 3 tablespoons reduced champagne and powdered sugar, whipping for another 2 minutes. Transfer to a piping bag with a large circular tip (a piping bag sans tip is fine, too). Place first layer of the cake on your cake stand, then generously pipe a circle of frosting around the outer edge of the top of the cake. In a random pattern, pipe frosting into the middle of the cake, then smooth out middle of frosting with a spatula, keeping the edge/outer rim of the frosting intact - basically like you are making a super shallow divot for the raspberry jam. Fill inner divot with 1/3 cup raspberry jam, spreading it evenly. Top with the next layer of cake, repeat frosting and jam. For the third layer, frost top of cake normally, then frost outside with remaining frosting. Use a cake spatula to scrape frosting from sides to create a "naked" look. Top with blackberries, edible beads, and edible flowers. This recipe was created for Rodelle by Broma Bakery.